A Pioneer of Chabad in the U.S. Rabbi Yaakov Aizer Dubrow was a lifelong student and teacher of his beloved Torah. A true servant of G- d is able to do His will and bring others closer to Torah no matter the circumstances, to rise above differences and work with other Jews to increase Torah learning and mitzvah observance. Rabbi Yaakov Aizer Dubrow, of blessed memory, was such a person. Forced to move, first within Europe and then across the ocean to America, due to pogroms and persecution, he influenced and strengthened every community he joined. He remained loyal to his rebbe even when separated from him and, at same time, built relationships with many rabbis outside of his chassidic community, working together with them on many communal matters. 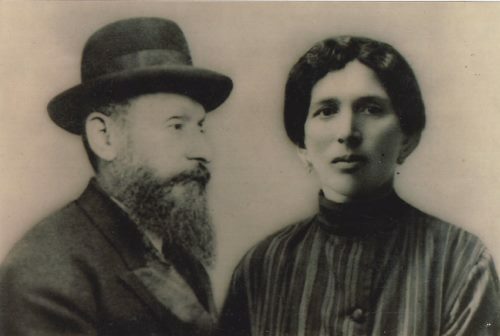 Rabbi Dubrow was born in 1881 in Zlobin, Belarus, to Rav Elyakim Getzel and Devorah Dubrow. His father, a judge and a student of the Mir yeshivah, devoted his life to Torah learning. Rabbi Dubrow followed in his father’s footsteps, dedicating his life to learning and teaching Torah. 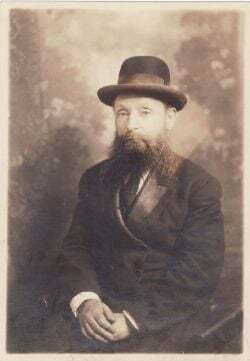 In Elul of 1897, at age 16, he left home to study at the newly-formed Chabad yeshivah, Tomchei Temimim, which was founded by the Rebbe Rashab, Rabbi Sholom Dovber Schneerson, the fifth Chabad Rebbe, in the town of Lubavitch in Belarus. After six years in Tomchei Temimim, Rabbi Dubrow received rabbinical ordination from Rabbi Shneur Zalman Kliatzkin, head of beit din (the Jewish court) of Rogotchov, and Rabbi Dovid Tzvi Chein of Chernigov. 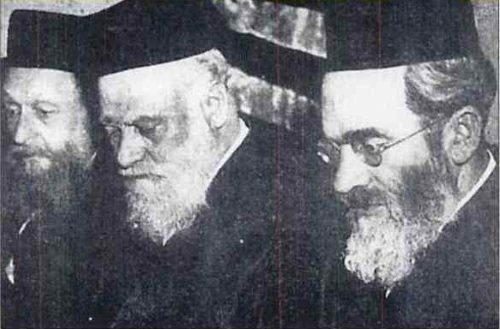 Throughout his life, Rabbi Dubrow remained a chassid, first of the Rebbe Rashab and then, after the Rashab’s passing in 1920, of the Previous Rebbe, Rabbi Yosef Yitzchak Schneerson, who had been the head of school of Tomchei Temimim. Rabbi Dubrow arrived in America before the Previous Rebbe, and he was instrumental in helping to bring him to America. Rabbi Dubrow married Chana Leah Shifrin, the daughter of the well-known Lubavitcher chassid, Gershon Shifrin. The Dubrows had seven children. Mrs. Chana Leah Dubrow was a key partner in many of her husband’s accomplishments. Rebbetzin Chana Leah spoke several languages and was highly educated, the only religious girl in her town to go to high school. Her top priority, however, was her husband’s Torah learning. When the Dubrows were in Odessa, before they left to America, they ran out of money to provide for their basic needs. Rebbetzin Chana Leah went out to sell apples in the market in order to ensure that her husband could continue learning undisturbed. Rabbi Dubrow must have been an outstanding scholar, because after he received rabbinical ordination, the Skverer Rebbe, Rabbi Dovid Twerski, hired him as a teacher for his son, Rabbi Yitzchak. After teaching Rabbi Yitzchak Gemara (Talmud) for two years, Rabbi Dubrow became a rosh hayeshivah (head of school) in Zivostav, a town near Kiev in Ukraine. Two years later, he became the rabbi of Shpitznitz, a town near Berdichev, where he remained for 12 years. In 1920 there was a pogrom in Shpitznitz, and Rabbi Dubrow escaped to Podolia and became the rabbi of Strizhivka, a town near Vinnitsa. While not much is known about Rabbi Dubrow’s life in Europe, it is clear that he was appreciated as a Torah scholar and was given rabbinical positions wherever he went. Rabbi Dubrow’s younger brother, Pesach Dubrow, had moved to America, and he arranged for Rabbi Dubrow and his family to join him. In 1924, at the age of 43, Rabbi Dubrow arrived in America. Rabbi Yaakov Aizer Dubrow served as a rabbi in Washington, D.C., in the first half the 20th Century. At the time, there were very few Lubavitcher chassidim living in America. Rabbi Dubrow found himself in a foreign land, far from his Rebbe and from other chassidim who shared his spiritual aspirations. But none of that deterred Rabbi Dubrow from serving G‑d under these new conditions. He intended to continue teaching Torah and leading a congregation in spiritual matters. And his scholarship and leadership qualities were recognized outside of the Chabad community. It was a non-chassidic rabbi, Rabbi Avraham Nachman Schwartz of Baltimore, who wrote a letter recommending Rabbi Dubrow for a position as a community rabbi. In 1925 Rabbi Dubrow was hired by Kesher Israel Congregation of Georgetown in Washington, D.C., as its first spiritual leader. 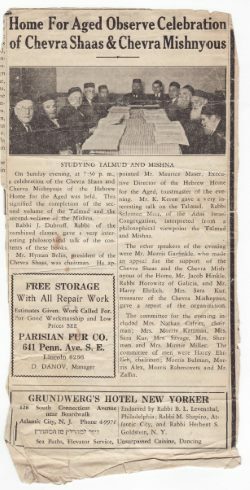 A contemporary newspaper clipping describing one of Rabbi Dubrow’s many deep lectures. We can assume that Rabbi Dubrow also learned Chabad chassidic teachings with his congregants, and indeed, a set of Likutei Torah, written by the Alter Rebbe, the first Rebbe of Chabad, was recently found at Kesher Israel. 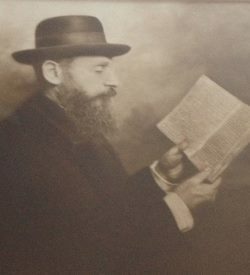 Inside the books there is a list of synagogue members who contributed towards their purchase; Rabbi Dubrow is listed at the top. Rabbi Dubrow’s love for Torah extended to Torah books. In his home in Washington, D.C., which was located above a department store, he collected books, old and new. However, he was willing to part with his precious books for a greater cause. In 1940 the Previous Rebbe miraculously escaped from war-torn Europe to New York, but he wasn’t able to bring his extensive library with him. Rabbi Dubrow wrote a letter to the Previous Rebbe, lovingly describing a 250-year-old book (Midrash Rabbah on Bereishit) which he had bound and which sat on his bookshelf “like a precious stone.” “It is very dear and beloved to me,” he wrote to the rebbe. Then he offered the book to the rebbe as a gift. “With this I will know,” he wrote, “that my heart is close to him [the Previous Rebbe] just as his heart is close to me.”3 The Previous Rebbe wrote a warm response accepting the gift. This book can still be found in the Chabad library in Crown Heights. As a community rabbi in Washington, Rabbi Dubrow drew not only on his love for Torah and holy books, but also on his love for his fellow Jews. The challenges he faced in America were very different from those he had dealt with in Europe. While his congregation consisted mostly of recent immigrants from Eastern Europe, and services had always been conducted in the familiar European manner, many synagogue members were not fully observant. Like other Jewish immigrants of that era, they struggled with Shabbat observance because of financial pressures. Jewish residents of Georgetown supported themselves by operating small shops in the neighborhood, selling groceries, fabrics, clothes, shoes and liquor. The stores were run as family businesses, with children often helping their parents. The storekeepers who prayed at Kesher Israel on Shabbat were often in a rush to finish the services before noon so that they could open their stores. Other areas of observance were also being neglected. Rabbi Dubrow with Rabbis Klaven and Silverstone. This was the situation that Rabbi Dubrow encountered when he was entrusted with leading Congregation Kesher Israel in 1925. A new immigrant himself, in a land foreign to him both physically and spiritually, he was faced with the task of preserving Jewish life for the older generation, and of reaching out to the younger members who were growing up in America, far from the European traditions and values that were so much a part of his life. Rabbi Dubrow did not limit his work to his own synagogue. He joined the Agudat Hakehilot of Washington, D.C., and participated in many community undertakings. Rabbi Shmaryahu Shulman, who was a student at the Ner Yisroel Yeshivah in Baltimore at the time, recalls a prayer gathering that took place in one of the largest synagogues in Washington when the news of the atrocities in Europe reached the community. Rabbi Dubrow was honored with the recitation of Psalms. Seventy years later, Rabbi Shulman still vividly remembers the sweetness of Rabbi Dubrow’s voice as he completed Psalm 22 with great feeling. Rabbi Dubrow participated in the efforts to save European Jewry. He was a member of a group of rabbis who met with President Roosevelt, as well as with senators in Washington, to arrange for a special exception in the immigrations laws that would allow the Previous Rebbe to come to America. After the Previous Rebbe arrived in America, Rabbi Dubrow helped raise money to support his activities. He would travel to New York often to visit the rebbe and bring the money he had collected. At the same time, he would also visit his married daughters in New York. One of Rabbi Dubrow’s grandchildren recalls that Rabbi Dubrow would test him on his studies and give him money as a reward if he did well. Perhaps Rabbi Dubrow derived his strength from his relationship with the Previous Rebbe, who encouraged him to strengthen the observance level in his community and provided specific advice on how to transmit the timeless messages of the Torah to the younger generation. It was the rebbe who had issued a call to action regarding the observance of the laws of family purity among young married women. Rabbi Dubrow responded to the call, and then reported in a letter to the rebbe that he had formed a committee of women dedicated to the mitzvah of family purity and had instituted lecture series on these laws. The rebbe responded with advice and encouragement. Some time later, another letter to the rebbe reported the completion of the new mikvah (ritual bath) in Washington. A community-wide celebration held in honor of the new mikvah was reported in the Washington Post. Mrs. Dubrow and her six daughters. Another letter of encouragement, sent on Chanukah of 1942, was written by Rabbi Menachem Mendel Schneerson, the son-in-law of the Previous Rebbe, who later became the seventh Lubavitcher Rebbe. In the letter, the Rebbe discussed the law that when lighting the Chanukah menorah, its light should be seen from outside, and that even those who live high up in an apartment building are obligated to place their menorahs where they would be visible. The Rebbe interpreted this law metaphorically, saying that even those select individuals who lead highly spiritual lives, who are located high above the material world, have an obligation to reach out to those below them and share their light with them. While these words were meant as encouragement for Rabbi Dubrow to continue reaching out to Jews in his community, they also indicate how highly the Rebbe thought of Rabbi Dubrow. Rabbi Dubrow also received specific instructions and requests from the Chabad headquarters in New York. In 1942 Rabbi Menachem Mendel wrote to Rabbi Dubrow asking him to reach out to a Jewish soldier who was working in Washington,“to influence him . . . to put on tefillin and to eat kosher, even at work.” Rabbi Menachem Mendel further encouraged Rabbi Dubrow to reach out to other Jews “whose hearts are touched by fear of G‑d”5 and to arrange kosher food for other Jewish soldiers in Washington. Rabbi Dubrow’s chief concern was the education of the children in his community. Together with the synagogue board members, he formed a Talmud Torah, a Hebrew school that met daily after public school hours. Boys and girls studied together, usually until the age of bar mitzvah, after which their parents often needed them to help out in the shops. Even though the Talmud Torah was very successful, Rabbi Dubrow felt that it wasn’t enough, as it was able to provide only a very limited Jewish education. His dream was to open a Jewish day school in Washington so that Jewish children born in America could learn Torah just as their parents did back in Europe. It was a lofty vision, but difficult to achieve. Many Jewish parents opposed the idea of a Jewish day school. They feared that separating their children from the public school students would hinder their ability to fully participate in American society. Rabbi Dubrow joined forces with other local rabbis, including Rabbi Yehoshua Klavan, Rabbi Jeremiah Weitz and Rabbi Moshe Chaim Levinson, and together they were able to address the parents’ concerns and raise funds for the school. In his final letter to the Previous Rebbe, written in 1944, shortly before his passing, Rabbi Dubrow joyously informed the rebbe that his dream had finally come true, as the first Jewish day school had opened its doors in Washington, D.C. He described the spacious building the community had purchased for the school and mentioned the school bus that was bought to transport the students to and from school. The school day ended at three o’clock, and a Talmud Torah for older children who attended public school took place in the school building at four o’clock. The older children learned Chumash (Bible) with Rashi’s commentary and Gemara. In its first year, the school had 24 full-time students and 10 Talmud Torah students. The school grew rapidly after Rabbi Dubrow’s passing and later became the Melvin J. Berman Hebrew Academy, which is still in existence today. Rabbi Dubrow’s delight at the school’s opening is evident from his letter to the Previous Rebbe. He wrote, “We teach them from a young age the way of the Torah and the tradition . . . And at twelve o’clock, when they eat lunch . . . we teach them to bless before they eat and bless the Birkat Hamazon after they eat . . . This is my portion from all my toil, because this is my life’s purpose: to spread Torah to young and old, and to do tzedakah [charity]and chesed [kindness], and to help those who seek help.”8 Rabbi Dubrow expressed his gratitude to G‑d for helping him actualize his dream and concluded the letter with a request for the rebbe to pray for him, perhaps knowing that his life was coming to an end. All his life, Rabbi Dubrow strove to serve G‑d and to disseminate Torah wherever he found himself, whether among advanced students as a rosh hayeshivah, among the members of his community, or among young children in a land where mitzvah observance was neglected. Despite the striking differences between the level of education and observance he was accustomed to in Europe and what he found on American shores, he did not complain or bemoan his fate or that of American Jewry. Instead, he devoted himself wholeheartedly to his work and rejoiced greatly at every step taken towards greater observance. 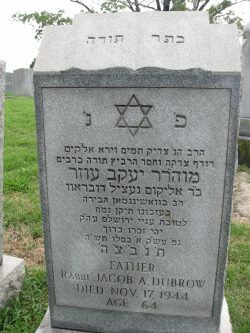 Rabbi Yaakov Aizer Dubrow’s tombstone. Even personal tragedies did not hinder Rabbi Dubrow’s holy work. 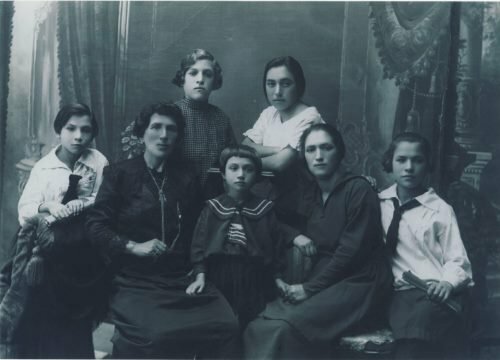 His wife, Rebbetzin Chana Leah, passed away from tuberculosis in her early forties, leaving him with several young children. Rabbi Dubrow carried on and eventually remarried. One of his married daughters also succumbed to tuberculosis. Rabbi Dubrow’s only son, Eliezer, who had saved the whole family during a pogrom, was drafted into the Russian army and had to remain in Europe. During World War II, Rabbi Dubrow lost contact with him. Eliezer was killed towards the end of the war. The fate of Eliezer’s wife and child is not known. Despite these tragedies, Rabbi Dubrow continued teaching and leading his community with true dedication. When Rabbi Dubrow passed away in 1944 at the age of 63, the community gathered for his funeral, and parts of Pennsylvania Ave. were closed off to accommodate the crowd. Even after his death, Rabbi Dubrow’s kindness continued. In his will, he requested that the extensive collection of books that he owned be sold at an auction and the money used for a fund for the poor of the land of Israel. Rabbi Shmaryahu Shulman purchased some of Rabbi Dubrow’s sefarim at the auction, and when he found Rabbi Dubrow’s Torah insights in the glosses, he had them published. Some of Rabbi Dubrow’s descendants continue his holy work, serving as rabbis and teachers. Rabbi Dubrow’s grandson, Rabbi Elyakim Getzel Rosenblatt, heads Yeshivah Kesser Torah in Queens, NY, which serves the community with many daily minyanim (prayer quorums) and Jewish outreach activities. Some of Rabbi Dubrow’s great-grandchildren are also involved in Jewish education. Rabbi Dubrow’s descendants also continue to disseminate Torah by sponsoring the printing of Jewish books. They sponsored the printing of the sixth volume of the Rebbe Rashab’s letters, as well as Torat Shalom, the halachic (legal) responsa of the Rebbe Rashab. Rabbi Dubrow’s descendants are always looking for more information about their illustrious ancestor. If any readers knew Rabbi Dubrow or have any of his books or writings in their possession, the family would very much appreciate being contacted at JR@jrcap.com. Rabbi Dubrow’s seventieth yahrzeit was on the 1st of Kislev of 5775. May his memory be a blessing. These letters appear in the Igrot Kodesh. Forty Years in Washington, or “Who is Who,” by Moshe ben Reb Tsaduk Alex, p. 18. As quoted in Kesher Israel Congregation: Change, Continuity, and Transition in Georgetown’s Only Orthodox Synagogue (1911-1993), by Jeremy Epstein, p. 13. Jews with non-Jewish spouses, however, were not buried in the synagogue’s cemetery. An Appreciation of Rev. O. Summer on the “sheloshim” of his death, by Rabbi Zemach Green, Jewish Ledger, August 3rd, 1945.